Many Swedes were horrified in early 2017 when U.S. President Donald Trump linked immigration to rising crime in Sweden, but an increasing number now agree with him. Amid soaring�crime rates, gang violence, complaints about education, and pregnant mothers even being turned away from maternity wards due to a lack of capacity, resentment in Sweden has built over the influx of more than 600,000 immigrants over the past five years. 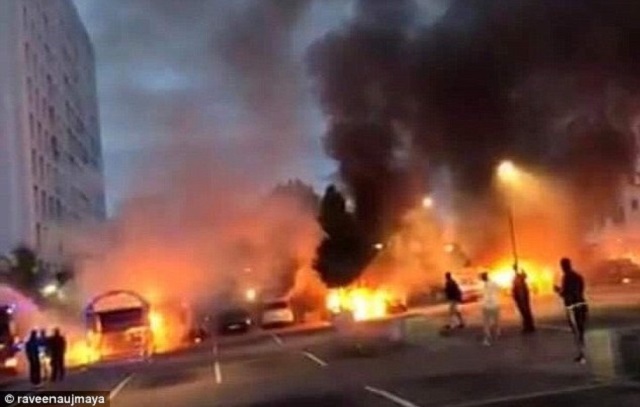 And tonight is one of the worst night for violence in recent history as police report multiple gangs of masked youths rampaging across three major Swedish cities, setting cars on fire in what seems like a coordinated action. Cars were also reported on fire in Malmo, at the southern tip of the country, and in Helsingborg, further south than Gothenburg. Photos from Gothenburg in Sweden right now. Fr�lunda: A group of about 6-8 masked youth fires and throws stones. 31 cars have burned and in addition to these 35 cars are injured. Nobody is arrested. Nordost: A group of about 8-10 young people throws stones and fires. 15 cars have burned. Nobody is arrested. Trollh�ttan: A larger group of about 30-40 young people throws stones and fires. Six cars have burned and another few cars must be damaged. Here roads have been blocked by youngsters and they have even thrown stones against the police and their vehicles. At the moment, identification of young people is ongoing. When most fires started within a short period of time, it can not be excluded that there is a connection between the fires, the case will be investigated. Polish patrons will remain in the affected areas as long as it is considered necessary. ...Trump was right after all.